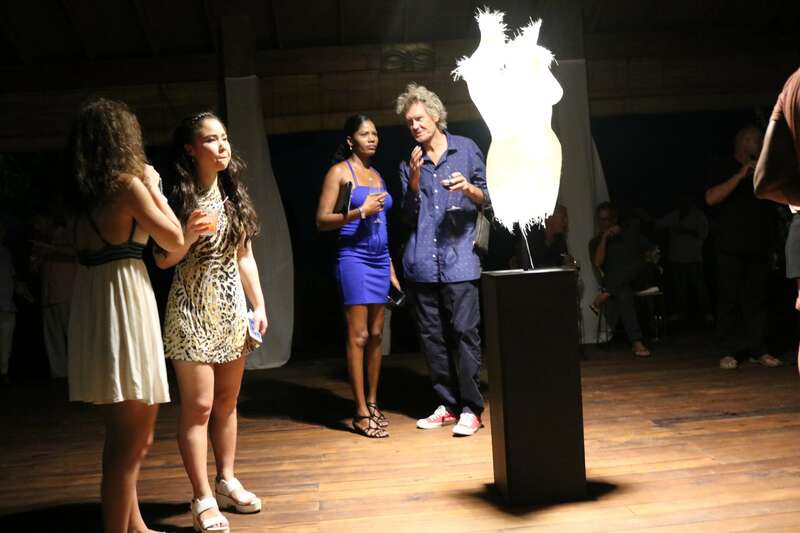 Just Before Christmas Rene opened his solo exhibit at the lovely Laluna Resort on the south western shores of Grenada. 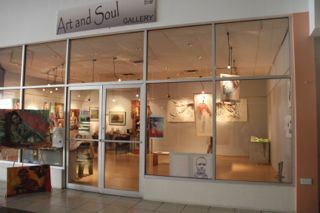 Read this review of the exhibition by Asher Mains. There is more than what meets the eye at Rene Froehlich’s solo show, “Inside Out” at Laluna in association with Susan Mains Gallery. 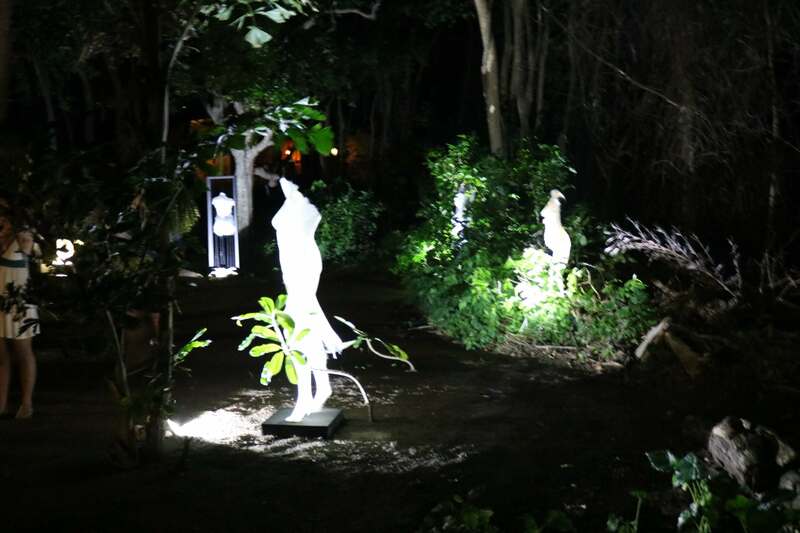 Which, after seeing illuminated figures glow against the back drop of the Caribbean Sea only to see more figures emerging from the lush, idyllic surroundings, is saying a lot. What is obvious is Froehlich’s mastery of his material and his dedication to the form. As someone who has used his medium to hand build racing yachts, this handling is more delicate, more subtle; more intimate. Immediately, recognisable feminine forms emerge that are treated with a quiet reverence in the execution as well as the exhibition of the work. Despite the fact that there are no complete figures, the oeuvre does not imply violence even as midsections are torn and exposed and limbs are, at times – absent. The process of creating this figures from a harsh, potentially violent material itself, fibreglass, is part of the secret of this work. The application of the fibreglass to the mould comes with applications of resin; sometimes 12 to 15 layers of resin with a drying time of 2 hours for each layer. “Haste is a form of violence”, a quote often attributed to Gandhi, seems to imply a beautiful peace in Froehlich’s work which is so intimately prepared. The material itself is harsh and unforgiving and leaves its marks on the artist’s hands and arms. 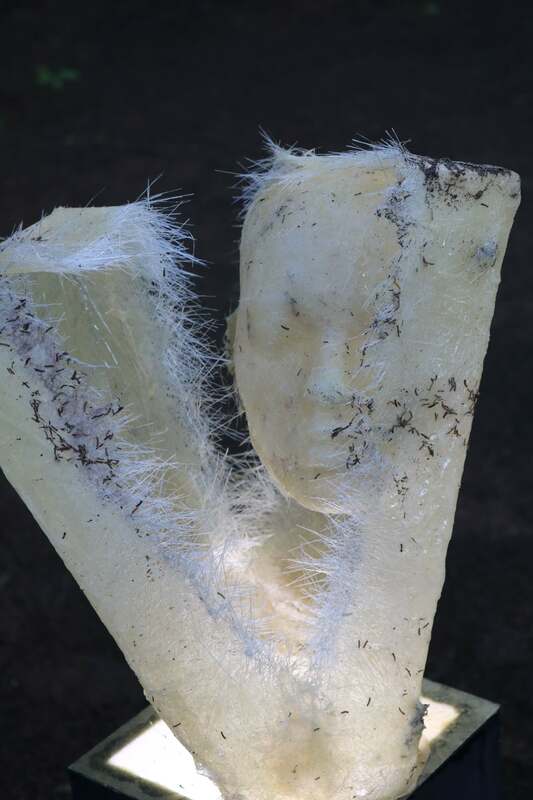 Yet it is this vex material that the artist is able to subdue and mould. Intimate knowledge of the material, intimate knowledge of the form, the relationship between the artist and their material is a level of understanding and connection that is mysterious to the uninitiated. 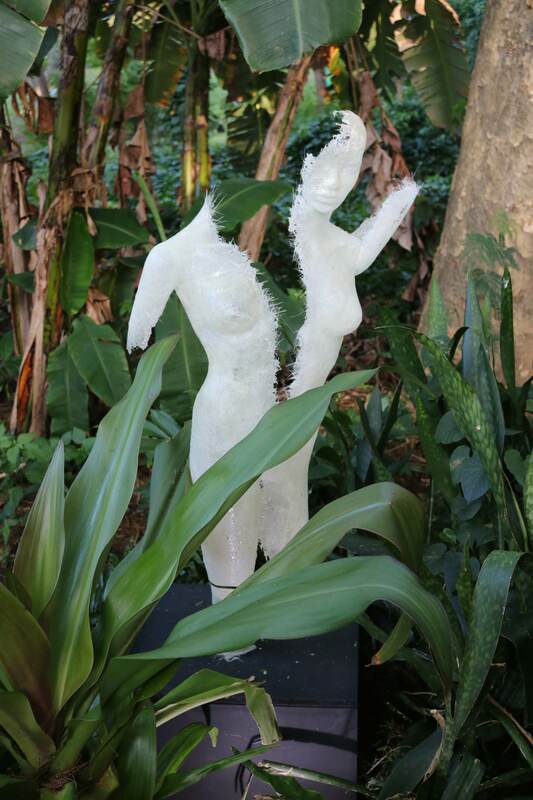 Grenada can be a mysterious place to the uninitiated as well, which makes the indulgence in the setting at Laluna a natural, serendipitous and essential backdrop for displaying these figures. The conversation between the figures and the environment is a conversation had quietly and amongst those who can keep a secret. It references, tangibly, a sense of place for both the artist and the artwork. This is the environment in which the work was created but it is also the environment in which the work breathes. The place we live, where we’re from, has a quiet pull on us as it constantly gives us feedback as to who we are. Empathising with the figures as they stand in a clearing, in the sand, amongst trees; we know these feelings and we can identify. Unlike a gallery, which serves to create an alternative environment free from ‘distractions’, Froehlich’s work pulls the figures, pulls us, into a space where we know ourselves, we know the figures and then in a delicate move, we are known by them. One piece of Froehlich’s work, in particular seemed to be an homage to the surrealist painter, Salvador Dali. A woman’s torso with drawers protruding from her body, an allegory for the many categories a woman has to be a member of in life, glows in this sculptural rendition. This, to me, is a clue as to how one may unravel the mystery behind “Inside Out”. Dali, as discussed in a recent BBC article, was interested in theoretical physics and in his 1958 Anti-Matter Manifesto briefly explained his interest in the interior and exterior and how a fascination with psychology developed into a fascination of physics. Let me say this boldly, Rene Froehlich’s, “Inside Out” can be understood not only as an intimate narrative but as Mobius Strip. By definition a Mobius Strip is a surface with one continuous side formed by joining the ends of a rectangular strip after twisting one end through 180°. With a Mobius Strip there is no inside or outside because following the course of the strip will enable you to cross over seamlessly from what appears to be inside and what appears to be outside. When looking at Froehlich’s work, many times the figures work sculpturally whether they are seen from the outside in or the inside out, or inverted. What makes Froehlich’s work like a Mobius Strip is that “twist” which is essential in creating something that can be viewed seamlessly, along all edges, as if there was no separation between what is outside and what is inside. This “twist” is intimacy, this “twist” is the environment, it is about relationships, this “twist” is Froehlich’s mastery, and without any one of these “twists”, the work would fall flat. Froehlich’s exhibit, on display until January 25th, 2017 at LaLuna implores the viewer to engage in no easy task but offers great reward for those who would walk this Mobius path that the artist has moulded and set in Laluna’s sanctuary by the sea. January 5, 2017 in Rene Froehlich, Uncategorized.